Aeromatic, Aeromaster, & Everel Info. Home » Aeromatic, Aeromaster, Everel Corp. Collection » Aeromatic, Aeromaster, & Everel Info. Aeromatic and Aeromaster propellers, manufactured by the Koppers Co. are for engines from 65 h.p. to 330 h.p. The three Aeromatic models are constant-speed types and the Aeromaster is ground-adjustable. Hubs are chrome-nickel-molybdenum and the blades are laminated maple. Weights vary from 28 up to 62 pounds for the larger models. * The Air-Controlled Automatic Propeller—Licensed under Patents of Everel Propeller Corp. The Aeromatic propeller is a two-blade variable-pitch unit, which is entirely self-contained. The single-piece hub of chrome-nickel-moly steel retains blade flanges on large ball thrust bearings. A synchronizer gear between the blade flanges co-ordinates their movements. Adjustments for pitch range, balance and lubrication are all accessible externally. Blades for the Aeromatic are made of thin lamination of maple or birch bonded with thermal-setting resin to provide a structure stronger than a natural wood blade. AEROLOID plastic sheeting is pressure bonded to the exterior of the blade for protection against abrasion and moisture absorption.Monel leading edge tipping is applied over the AEROLOID plastic to protect the leading edge of the blades. Threaded ferrules are affixed to the blade butts by the standard lag screw method of blade retention. The threaded feature allows the blades to be removed from the hub without disassembly. The fully automatic operation of the AEROMATIC propeller eliminates the use of any controls from the pilot or engine on the model 220. The natural, physical forces acting on the blades and counterweights are utilized to accomplish the desired pitch change. Substantial performance advantages are made possible with the Aeromatic due to the greatly increased propeller and engine efficiencies afforded by automatic operation. Prevention of engine damage as well as maximum operating economy is attained through automatic response to changing conditions of flight. Shorter Take-off: At take-off the blades move to low pitch automatically permitting the engine to develop full take-off power. This gets the plane off the ground quicker. 1/3 Higher Rate of Climb: Best climb power is maintained as the propeller automatically adjusts pitch to correspond to correct climbing speed. This gets the plane to cruising level fast, on minimum fuel. Greater Cruising Range and Speed: Economical cruise power is maintained as the Aeromatic selects the most advantageous pitch at all normal altitudes. Safer Landing: Automatically adjusts its pitch for a long, flat glide. In the event of overshooting during landing, full throttle will locate the blades in low pitch, making take-off power immediately available. Models 220-1 and 220H are modified versions of the Model 220 with Aeromatic Hi-Cruise control assemblies. The model 220-1 Hi-Cruise control is actuated manually through a control cable and bell crank. The Model 220H Hi-Cruise pitch change mechanism is actuated by a hydraulic cylinder, which is operated by engine oil pressure controlled through a special control valve. The Hi-Cruise control unit permits a selective pitch change range of several hundred RPM. This feature is of exceptional value when the airplane is flown at altitudes above 5000 feet. This feature also permits the choice of using the propeller as a standard Aeromatic or as a selective RPM propeller. 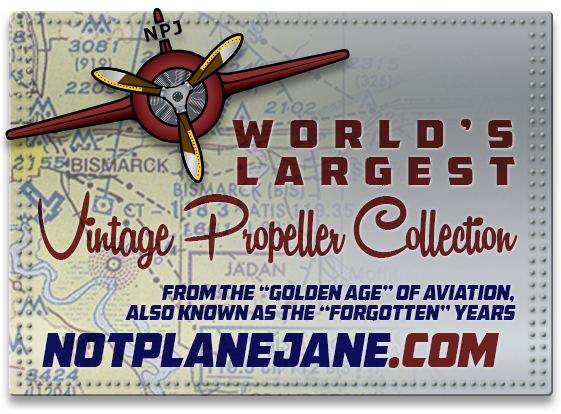 These propellers were certified on most of the production airplanes during the big airplane boom right after WW II.AERONCA • BELLANCA CRUISAIR • STINSON VOYAGER, FLYING STATION WAGON & L-5 • GRUMMAN WIDGEON • MONOCOUPES • TAYLOR CRAFT •PIPER SUPER CRUISER & FAMILY CRUSIER • FAIRCHILD 24 • CESSNA 120, 140 & 165 AIRMASTER • JOHNSON ROCKET• MEYERS • RYAN NAVION • SWIFT 125 • ERCOUPE • and were being approved for other makes and models and also were available for numerous foreign models. The Propeller with a Brain for Tomorrow’s Plane AeromaticAir Controlled Automatic PropellerLicensed under patents of EVEREL Propeller CorporationKOPPERS Co., Inc., Bartlett Hayward Division, Baltimore 3, Md. * Walter E. Everets, was the designer of the EVEREL Single Blade Propeller. During the testing and experimental stages, Everets, found that the single blade produced 25% greater thrust than the conventional two-blade propeller.Nearly sixty experimental full-sized blades and more than a dozen hubs and mechanisms were built and tested before the 40-horsepower model of the single blade was submitted for an Approved Type Certificate, which was received for the Taylor A, and the J-2 Cub.Another Everel propeller is on display at the Pearsons Air Museum in Vancouver, Washington.